Credit: The labs of Wei Guo, PhD, and Xiaowei Xu, MD, PhD, University of Pennsylvania. PHILADELPHIA – Cancer cells are more than a lump of cells growing out of control; they participate in active combat with the immune system for their own survival. Being able to evade the immune system is a hallmark of cancer. Cancer cells release biological "drones" to assist in that fight–small vesicles called exosomes circulating in the blood and armed with proteins called PD-L1 that cause T cells to tire before they have a chance to reach the tumor and do battle, according to researchers from the University of Pennsylvania. The work, published in the journal Nature, is a collaboration between Wei Guo, PhD, a professor of Biology in the School of Arts and Sciences, and Xiaowei Xu, MD, PhD, a professor of Pathology and Laboratory Medicine in the Perelman School of Medicine. While primarily focused on metastatic melanoma, the team found that breast and lung cancer also release the PD-L1-carrying exosomes. The research offers a paradigm-shifting picture of how cancers take a systemic approach to suppressing the immune system. In addition, it also points to a new way to predict which cancer patients will respond to anti-PD1 therapy that disrupts immune suppression to fight tumors and a means of tracking the effectiveness of such therapies. "Immunotherapies are life-saving for many patients with metastatic melanoma, but about 70 percent of these patients don't respond," said Guo. "These treatments are costly and have toxic side effects so it would be very helpful to know which patients are going to respond. Identification of a biomarker in the bloodstream could potentially help make early predictions about which patients will respond, and, later on, could offer patients and their doctors a way to monitor how well their treatment is working." "Exosomes are tiny lipid-encapsulated vesicles with a diameter less than 1/100 of a red blood cell. What we have found with these circulating exosomes, is truly remarkable," said Xu. "We collected blood samples from melanoma patients treated with anti-PD1 therapy. This type of liquid biopsy assay allows us to monitor tumor-related immune suppression with time. " One of the most successful innovations in cancer therapy has been the use of checkpoint inhibitor drugs, which are designed to block attempts by cancer cells to suppress the immune system to allow tumors to thrive and spread. One of the primary targets for this class of drugs is PD-1, a protein on the surface of T cells. On tumor cells, they express a counterpart molecule called PD-L1, which interacts with the PD-1 protein on T cells, effectively turning off that cell's anti-cancer response. Blocking that interaction using checkpoint inhibitors reinvigorates T cells, allowing them to unleash their cancer-killing power on the tumor. While it was known that cancer cells carried PD-L1 on their surface, in this new work, the team found that exosomes from human melanoma cells also carried PD-L1 on their surface. Exosomal PD-L1 can directly bind to and inhibit T cell functions. Identification of the exosomal PD-L1 secreted by tumor cells provides a major update to the immune checkpoint mechanism, and offers novel insight into tumor immune evasion. "Essentially exosomes secreted by melanoma cells are immunosuppressive." Guo said. "We propose a model in which these exosomes act like drones to fight against T cells in circulation, even before the T cells get near to the tumor." 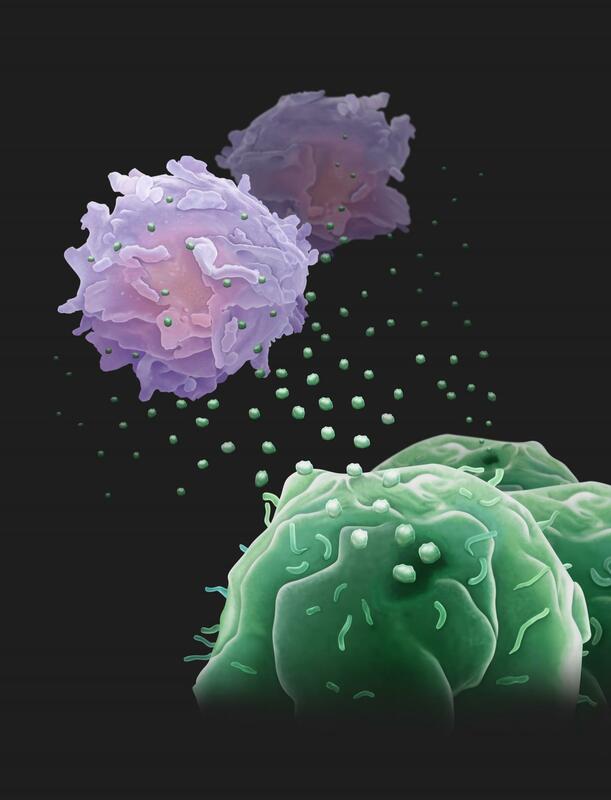 Since a single tumor cell is able to secrete many copies of exosomes, the interaction between the PD-L1 exosomes and T cells provides a systemic and highly effective means to suppress anti-tumor immunity in the whole body. This may explain why cancer patients might have weakened immune system. Because exosomes circulate in the bloodstream, they present an accessible way of monitoring the cancer/T cell battle through a blood test, compared to the traditional more-invasive biopsy of tumors. After an acute phase of treatment, the researchers envision such a test as a way to monitor how well the drugs are keeping cancer cells in check. By measuring pre-treatment levels of PD-L1, oncologists may be able to predict the extent of tumor burden in a patient and associate that with treatment outcome. In addition, a blood test could measure the effectiveness of a treatment, for example, levels of exosomal PD-L1 could indicate the level of T cell invigoration by immune checkpoint inhibitors. "In the future, I think we will begin to think about cancers as a chronic disease, like diabetes," says Guo. "And just as diabetes patients use glucometers to measure their sugar levels, it's possible that monitoring PD-L1 and other biomarkers on the circulating exosomes could be a way for clinicians and cancer patients to keep tabs on the treatments. It's another step toward precision and personalized medicine." Guo and Xu coauthored the work with Penn's Gang Chen, Alexander C. Huang, Wei Zhang, Min Wu, Jiegang Yang, Beike Wang, Honghong Sun, Wenqun Zhong, Bin Wu, Xiaoming Liu, Lei Guan, Tin Li, Shujing Liu, Ruifeng Yang, Youtao Lu, Liyun Dong, Suzanne McGettigan, Ravi Radhakrishnan, Junhyong Kim, Youhai H. Chen, Giorgos C. Karakousis, Tara C. Gangadhar, Lynn M. Schuchter, and E. John Wherry, as well as collaborators from Wuhan University, The Wistar Institute, Xi'an Jiaotong University, the University of Texas MD Anderson Cancer Center, and the Mayo Clinic. The research was supported by the National Institutes of Health (GM111128, GM085146, AI105343, AI108545, AI082630, AI117950), the Parker Institute for Cancer Immunotherapy, the American Heart Association, the Tara Miller Foundation, the University of Pennsylvania, the Wistar Institute, the Dr. Miriam and Sheldon G. Adelson Medical Research Foundation, the CAST Foundation, and the NSFC Foundation.